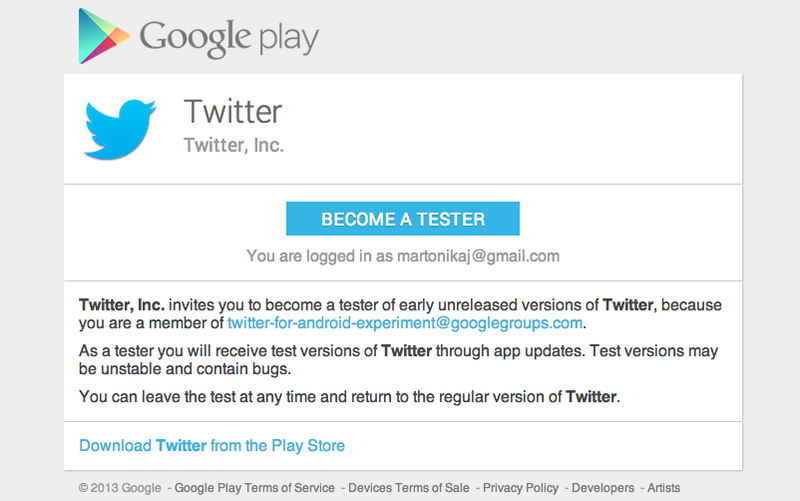 Twitter is jumping on the official Google Play bandwagon today, opening up experimental builds of its app to willing testers. Just as we've seen recently with Facebook's move to proper beta testing, Twitter is opening up the program through Google Groups to anyone that wants to sign up. Once signed up, your account will be flagged as on the beta track, and you'll soon see an update via the Play Store to the latest experimental build. From that point forward, you'll receive updates on the beta track ahead of the stable release. As is the case with other beta builds, you'll want to be prepared for a little bit of instability and a few bugs along the way. But if you're willing to handle some of these issues, you will get access to the latest features that Twitter is testing before they hit the general public. If you're interested in signing up for the beta testing group, you can do so from the source link below.